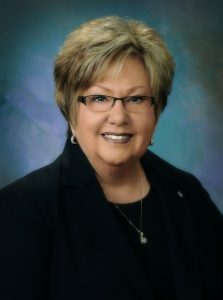 Pat Reed is the Commissioner of the West Virginia Department of Motor Vehicles (DMV). Jennifer Carpenter-Peak is a resident of Berkeley Springs, West Virginia. Carpenter-Peak received a notice in the mail saying her vehicle registration was up for renewal and it would cost her $30. She checked the $30 box and sent in her check. A few weeks later, Carpenter-Peak gets her check sent back to her with a letter from the DMV. 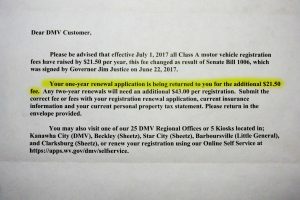 Turns out that at the end of June, the state legislature hiked the DMV registration from $30 a year to $51.50 a year. Governor Jim Justice signed the hike into law on June 22 — effective July 1. But Pat Reed, the Commissioner of the DMV, had already sent out about 200,000 notices to DMV customers telling them that the fee was $30. And about 180,000 of those customers — including Carpenter-Peak — marked the $30 box and sent in their checks. Reed says that the DMV returned those 180,000 $30 checks with a note asking for $21.50 more. She said she had no choice. Did the legislature tell Reed that she should return all of those checks? But since these 180,000 West Virginians were billed $30, for them, couldn’t you just leave it at that? Reed said that she consulted with attorneys and they advised there was no way around it. Carpenter-Peak said that the letter she got from the DMV had Governor Jim Justice’s name on it. The Governor’s press office did not return calls seeking comment.